Increasingly, retailers and manufacturers are seeking Order Fulfillment Value Added Services to improve the efficiency of their operations, simplify processes, shorten their supply chain and trim costs. At Kendrew, we offer a portfolio of value added services at point of origin, destination or within our facilities. What differentiates us is the way our Third Party Logistics team works with your people to fine-tune a truly customized solution for your business. Receiving & Labeling: Receiving and labeling your warehouse and inventory correctly can have significant impact on the effectiveness of your operation. We identify and implement best practices that work for your and our operation early to save on supply chain operation time and labor. Warehousing: Warehouse receiving operations are critical part in maintaining the integrity of inventory systems and ensuring the availability of products for customers. We have implemented an effective receiving and inventory management system to ensure items don’t fall through the cracks, are counted correctly and receive adequate inspection to ensure customers don’t receive product that could affect profitability. Picking: Your inventory will be on-hand, organized and tracked to ensure the picking process is streamlined for timely and accurate deliveries. Order Staging: We have a dedicated area that enables our specialized team to perform valued added services to your products. Commonly used for promotional literature, welcome kits, consumer goods product samples and new product launches, etc. Packing & Packaging: Providing you with the required packaging such as standard or custom boxes, labeling and shrink wrap. Shipping: Your shipping strategy is an integral part of your overall business profitability and brand. We will not only deliver your produces on time and cost-effectively, but we can also deliver your products that create a great brand experience for your customers. Invoicing: Upon order fulfillment and based on the shipping cost of customer preferences, an invoice gets created and sent by email when the status reaches “shipped” or other pre arranged terms and conditions. Pick N Pack: We see the picking of ordered goods and packing them to be shipped to your customers as an extension of your customer service. As your business grows, we recognize the importance of accurate and efficient shipments that arrive on time to your customers. 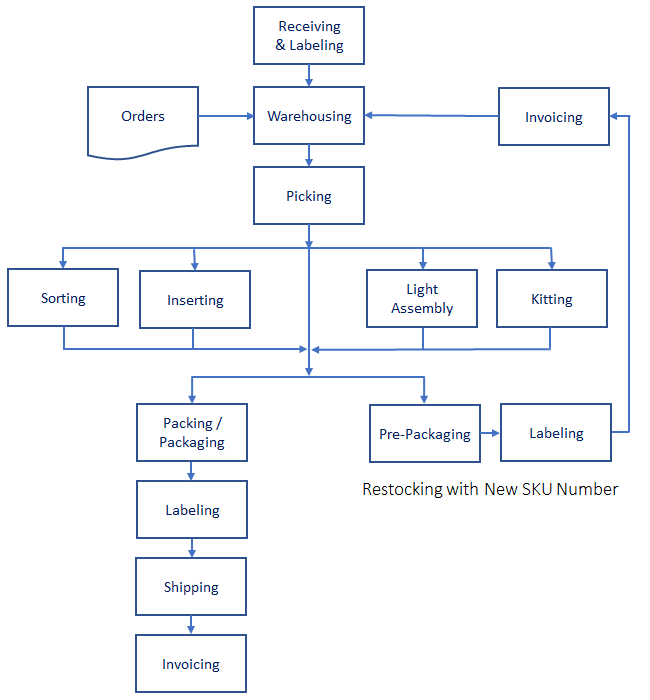 Order Batching: We provide batching services where one SKU is picked to fill multiple orders simultaneously. All relevant orders are then assembled, organized and consolidated by order or shipping destination in a cost effective and timely manner. Pre-Packaging: We provide Pre-Packaging & labeling services where several related products are grouped together using our kitting, light assembly, sorting or inserting services, and then restocked with a new SKU and label for future orders. For example, clients expecting large volumes due to running promotional offers will get orders processed faster, receive improved delivery times as well as reduced shipping costs. Cross Docking: We provide cross docking service to ensure your products moves quickly through the order fulfillment process to avoid the extra cost of warehousing and handling. Same Day Deliveries: We offer solutions that far exceeded our customer’s expectations by guaranteeing deliveries on time and in perfect condition. White Glove Deliveries: When you need more than just delivery, we offer our white glove delivery services which includes setups and installation. Reverse Logistics (Returns): Managing returns and solving customer issues effectively can turn customers into lifelong clients. We will ensure the paperwork, following-up, inventory management is done correctly and efficiently to prevent loss of productivity and revenue. Customs Brokerage Services: As a Third Party Logistics company, we will take the hassles out of your cross-border shipments by arranging the transportation of your product to and from the Canada, USA and Mexico boarders.